update the style of your home as well as add immediate capital value. 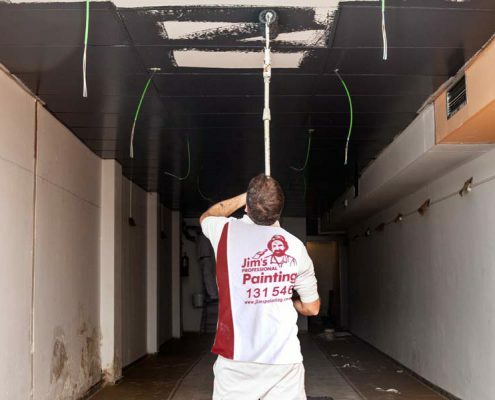 We at Jim’s Professional Painting Service know how important it is to have a trusted and knowledgeable person handling your interior painting projects. This is why every one of our interior painters are reliable, experienced and above all enjoys what they do… and it shows in the quality of our work! We aim to consistently deliver a superior level of service for all of our interior house painting clients. Our painters take pride in their work and focus on what is most important; customer satisfaction. They provide this from the very first contact through to their detailed consultation, colour advice and professional workmanship. Particular focus is placed on protecting your furniture and flooring whilst painting as well as a thorough clean up after each day’s work to minimise disruption to your household. This is just another reason why we are proud to offer our famous Jim’s 100% Satisfaction Guarantee – so you can feel 100% at ease that you will be satisfied with the end result. So if you’re after an affordable yet professional interior painting service from a brand that you can absolutely trust, give Jim’s interior Painters a call today on 131 546 or fill out our free quote form..